Among the rest, by his abominable industry and destructive genius, he assisted in the fatal and infamous production of the monster Minotaur, that devourer of promising youths. And then, to cover one mischief with another, and provide for the security of this monster, he invented and built a labyrinth; a work infamous for its end and design, but admirable and prodigious for art and workmanship. Champion introduces a mythology specialist, Edith Hall, who points out that Daedalus, as a mythological artisan, in unusual first in being human rather than divine, but also in always showing a dark side to his inventions: he doesn’t suffer, but other people do from what, essentially, is his irresponsibility. And so Bacon, in inaugurating the modern scientific project, is concerned lest people don’t think hard enough about consequences, or become driven by pride. For his project was for all humanity to expand and participate in God’s work, but he saw that the individual worker was only human, and liable to cunning and vanity as well as good intentions. The most telling interview is with nanotechnologist Prof Richard Jones, who responds to Bacon’s use of the Daedalus myth by confirming how much scientists may be motivated by the approval of their peers. His first example is nuclear weaponry, in which the motivation of the pioneers was, firstly, doing what society asked of them (which is, of course, a complex enough issue in itself), but also in some cases, he has no doubt, the solving of “technically sweet problems”. In conversation with him, Champion takes comfort in the fact that Daedalus usually manages to find a fix for the problems he has caused, but Jones is less sanguine. For evidence he cites the nitrogen fixation process of Haber and Bosch, whom he calls “the most important people of the twentieth century”, and not for good reasons, but as the greatest example of unforeseen effects of science and technology. Others agree with this assessmenst, it appears. As he explains, their process was developed to enable the mass production of high explosives in World War 1, a questionable and world-changingly costly project in itself (what society asked them to do? A technically sweet problem? Or just highly lucrative?). But it also led directly to the production of artifical fertilizers, in turn the major cause of the population growth of the twentieth century. The process itself is dependent on fossil fuels, whose subsequent use is the major cause (if we accept that evidence) of climate change. Jones points out that there is no current fix for this vicious circle – higher population requires more artifical fertilizer, and so more fossil fuel dependence. Daedalus has lost the key to the labyrinth. Well, that’s true, I suppose – just as we get the governments we deserve. But it is small comfort, given the realities around us, to know we deserve them. Is it not rather naive (given daily experience another set of ancients discussions by the likes of Plato in The Republic) to pin our hopes for purely beneficial science and technology on democracy, especially given its recent track record around the world? There is, of course, no more simple answer to the harmful spinoffs of technology than there is to the problem of evil in general. Would it have been any better had Haber and Bosch developed their process in order to make food cheap and plentiful, rather than in order to blow up young men? And if that had been their motivation, ought they to have abstained on Malthusian social Darwinism grounds and let nature take its course? Such social engineering was part of the German reason for wanting to win the war anyway, so it cut both ways. Yet it has to be helpful when a programme like this reminds us that science is not The Answer To Everything beamed in from the land of truth to sweep away all superstition and wrong, but another integral part of the human condition just like those things that inspire it and pay for it (from this programme alone including politics, greed, curiosity, religion, fear, patriotism, pride and mythology). Scientists are no more responsible than the rest of us to have the right motives, and the character that produces them – but they are no less responsible, either, to be educated in the things that build character. Doubly so now that their errors can cause the world, rather than just Icarus’s wings, to melt. And that takes us back to another ancient, largely discarded, view of the primary role of all true knowledge and wisdom – to live the life of virtue. This entry was posted in Creation, Philosophy, Politics and sociology, Science. Bookmark the permalink. I think it’s a little too bleak to say there’s no fix. Demographic evidence is pretty clear that when people start to get serious economic benefit from modern technology they start to curtail the size of their families because modern life requires much more investment per child to get them to functioning adulthood and infant/child mortality goes down so much. The process of the population curve reaching an inflection point has already started in a lot of places. Beyond that the plant scientists are making progress on getting nitrogen fixation organisms to do their thing with non-legumes, and (momentarily quiet your European anxiety about GMOs) engineering N2 fixation directly into crop plants should eventually be possible. This would alleviate the energy cost of fertilizer and, since you obviously have to make it a product inhibited process, it would also solve the excess soil nitrogen runoff problem. Along the way they can work on how to recycle phosphate to compensate for the limited natural phosphate deposits. I think it would be deliciously ironic if all the anti-technology folks were rescued in the end by genetic engineering (Daedelus pulls the fat out of the fire after all,) but it remains to be seen whether mass hysteria or cool heads will prevail, and if the cool heads can get solutions implemented before everything disintegrates. The worst problem is that there may be excess of fossil fuel in the ground, more than we can afford to burn for the climate’s sake – there was a paper arguing this position a few weeks ago, but there is a long tradition of drastically overestimating natural resource deposits in a given area until they are nearly gone, and there was another paper recently arguing that shale gas reserves are proving to be far lower than early estimates. A high school classmate of mine is at Cal Tech, and he did an extensive analysis of worldwide coal deposits (lecture on Youtube.). He concluded that there is not nearly as much recoverable coal in the ground as the IPCC has assumed. If the rising cost of extraction doesn’t adequately curtail use, the political will to force the switchover is going to be hard to find. Nell is tied to the tracks. Will Dudley Doright get there in time? Tune in in a couple of decades to find out. Technology can often provide solutions – even when the problems technocrats seek to solve nay, to varying degrees, be created by a previous technological solution. 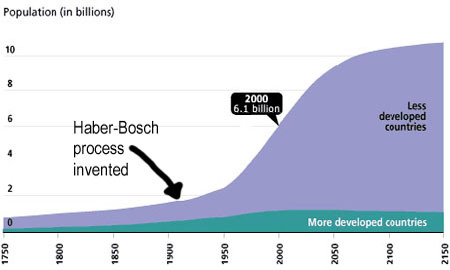 To continue with fossil fuels, the efficiency these are used has increased many many times over the past 100 years. We are now on the cusp of following Nature, in that CO2 can be used as a feed stock (react with H2) to make valuable materials to bring comfort to communities – it is possible to do this with good economics, so we can achieve zero-impact to the environment and extend the period for useful fossil fuel power to the developing nations (cheap power has underpinned economic development of all nations). It is not Nell that is on the railway tracks – rather it is big bad capital(ists) who have invested so much in dirty use of fossil fuels and poor efficiency plant, and they seek ways to derail all trains and stop progress. Along comes Dudley with half-baked notions of alternate cleaner(?) (insert here costlier) energy, and we have the perfect setting for more problems. Me thinks there is irony in all of this! Jones in the radio programme reflects the current tendency to pessimism, of course – though the overall balance of the programme was just that: maybe, maybe not. Still the exploration is a useful one, as it is science and technology that has been providing solutions and problems in comparable measure since Bacon’s time. There were problems before this, such as Greek shipbuilding of the classsical era causing deforestation, though some of the other proposed anthropogenic problems in prehistoric times seem to smack of self-justification (or alternatively damning humanity) a bit. To me, if there’s a rule about it apart from the general human condition, it seems to be the attitude of considering nature as a blank canvas to write on (whether from Bacon’s idea of man as Lord of creation, or from the modern idea that it got here accidentally, so can only be improved by planning). Consider it as a balanced system of which we were intended to be a regulatory part, but our understanding has become clouded, and it would seem to make a difference to how we intervene (whether we’re optimists or pessimists). To Preston’s remarks, my gut response is whilst self-fixing nitrogen crops covering the earth appear to help the food problem, it would be a huge change to the balance of the global nitrogen cycle which is irreversible. Do we then have to develop a solution for an ensuing nitrate pollution problem? But it’s also true that well-fed and secure families, for a variety of reasons, have smaller families. What might have happened, I wonder, if the slow increase in population before fertilizers (preumably largely from better public health, clean water etc) had continued? 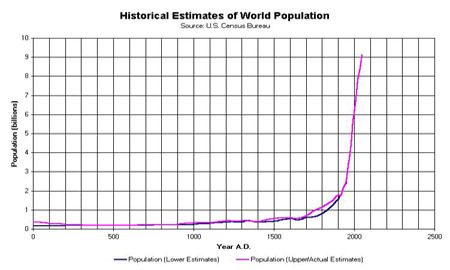 Sustainable population growth without needing to argue if the fuel resources would last 100 years or only 50? That’s why I said the process needs to be product inhibited, so only at much N as the plant needs gets fixed. (a) nitrogen fixation is of obvious advantage to plants. (b) It’s possible to do, because some plants have done it. (c) There is likely to be a reason, probably ecological, why it hasn’t become universal. (d) If we make fixation possible for agricultural crops, we will be knowingly covering 11% of the world’s land with them (the current percentage under cultivation), with the prospect of trebling that (according to estimates of what could be cultivated). (e) Ergo, we must not do it until we have found why nature hasn’t produced this feature, and have thought through how to compensate for those reasons to preserve to balance of nature. The issue of biodiversity figures too: only yesterday (driving between playing engagements) I was listening to a radio programme about the serious depletion of wheat varieties under the current industrial system – in the UK, only 30 varieties are acceptable, mainly because of things like conformity to milling technology. About 3 big companies control milling here centrally, and essentially dictate to farmers what they will grow to suit their criteria. The programme majored on the loss of qualities of taste etc from the extinction of local varieties, but of course there are other more serious biodiversity issues. Any technological fixes – and GM solutions from big industry are the quintessential example – reduce such diversity even further. Monsanto, like all big corporations, wants to corner the market and push its brands – they have no interest whatsoever in applying their technology to rare breeds, nor in allowing others to do so. Supporters of those rare varieties will, of course, have no interest in manipulating them genetically either, and will not have the financial clout of the big companies, nor political support for more than a token retention of seed-banks. So that’s why I’m scared of covering the whole world with a monoculture of grasses with biological features entirely alien to what they produce in nature. There are just not enough checks and balances within the systems that exist in the world as it is, and they do not appear to be a big issue for those actually doing the science and technology, except retrospectively when Nature articles put the population explosion down to the genie relased by Haber and Bosch a century ago. Charles might have gone further to reflect that underlying Haber’s flaws is the proposition, widely accepted and promoted by those involved in the public understanding of science today, that science is morally neutral. The Janus-faced nature of the Haber–Bosch recipe seems to support the contention. In Germany, moreover, scientists traditionally worked under the auspices of a civil service that was both apolitical and value free. Yet it was precisely this neutrality that provided an alibi for the German scientific community when Jewish researchers were expelled after the Nazis came to power. Haber was forced out of the Kaiser Wilhelm Institute, which he helped to found in Berlin, despite Max Planck’s attempt to argue his case with Hitler. “A Jew is a Jew,” Hitler shouted.